You can't beat a classic wrap dress for easy office style. I love printed dresses as they are instant outfits, with little to no accessorising required. Both of these Atmos&Here dresses have tulip hems. The tulip hem and midi length is something I'd usually worry would make my petite self look even shorter, but I don't feel that with these dresses. I love them both, even when worn with flats. Although I lay my outfit out the night before to make getting ready in the morning faster, I don't always know what accessories I'm going to wear. I was standing in front of the mirror trying to pick a necklace when I saw this turquoise and gold beaded one and realised it would be perfect, and meet the 'matchy matchy' theme for the #AutumnStyleFile challenge on Instagram. Only I got my days mixed up and the challenge for the day was actually 'colour makes me happy'. This dress was still perfect for that theme though with the colourful turquoise print. 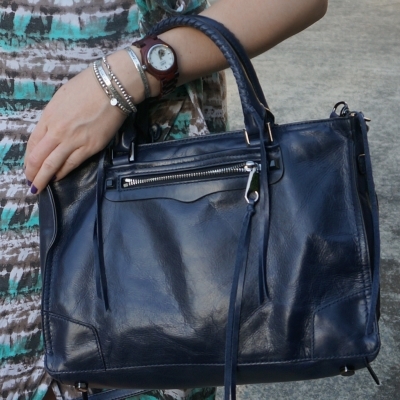 With the turquoise dress I thought the navy blue Rebecca Minkoff Regan bag would be a good accessory, and it's such a nice bag for the office with the structured sides. Last worn: printed wrap dress, camel flats, Rebecca Minkoff Regan satchel. Other ways to wear: printed wrap dress and ankle boots, camel flats and tights in winter, Rebecca Minkoff Regan satchel and shorts. Perfect for pregnancy: printed wrap dress in third trimester, camel flats in second trimester. This was my 'I don't know what to wear' outfit solution. The beautiful zig zag print wrap dress always gets compliments. It's the perfect dress to wear as it goes with any colour of accessories, although again I went with the navy Rebecca Minkoff Regan bag. There was no style challenge this day to help me pick out what necklace to wear like there was with the first outfit, so I went with this pretty gold beaded necklace that my bestie gave me, I thought it tied in nicely with the gold mouse flats. Last worn: chevron print wrap dress, gold mouse flats, Rebecca Minkoff Regan bag (above). Other ways to wear: chevron print wrap dress in winter, gold mouse flats and flare jeans, Rebecca Minkoff Regan bag and sheath dress. Perfect for pregnancy: gold mouse flats in second trimester. A wrap dress is one of those classic wardrobe 'must-have pieces' I completely agree with and think everyone needs in their wardrobe. They work in pregnancy, although you may need to size up to continue to cover an expanding bump. The turquoise printed wrap dress above is a size larger than normal and I wore it through my third trimester. The wrap style is perfect for breastfeeding post-baby too, flattering on any leftover baby bump and something you know will fit even with all the postpartum body changes! And of course, they work in an office setting. A great all-rounder! Linking up with Trend Spin, On Trend, Confident Twosday, Wardrobe Wednesday, What I Wore, Style On The Daily, Oh Hey Girl, Fashion Frenzy. Love the colour of that bag and those mouse shoes are the cutest! They are definitely mice, not wombats! Super cute!!! But I prefer the stripes one though! 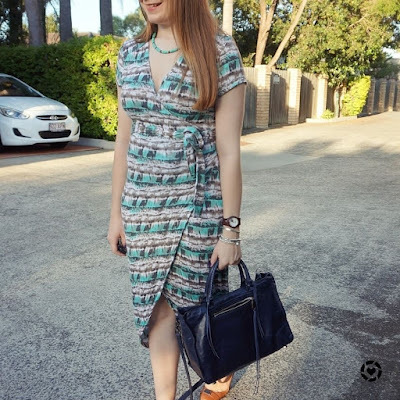 I love wrap dresses, they're such a great staple and I think they suit everyone! Hope you have a lovely week and that it's not too hectic! I love both of your wrap dresses! The print on both are really pretty and it's a one and done outfit when you are trying to get out the door. Your MJ flats are so fun! I love them whether they are a mouse or a wombat! So so cute! Wishing you a marvelous week! Happy Monday! haha yes, they are cute no matter the animal! I really love both dresses so much!! It's funny because I don't have any wrap dresses but the really are such a classic. The tulip hem gives it a nice extra touch as well. Lovely looks for both days! I don't wear them often, but I am glad to have them in my wardrobe! :) They are a classic! Wrap dresses are auxh amazing items of clothing, I agree. Discovered them in my first pregnancy and keep loving them, especially for the office. Yes, they are so good for the office! Easy pregnancy office wear! haha a printed dress always looks like you put more effort in than you really did! A beautiful style of dress! And I like it in the both patterns. Cool looks and I think it very light and breathable. Your wombat shoes, that is too funny! I'm not even sure exactly what a wombat looks like, ha! I love both of these dresses and am drooling over that bag. I tend to go for function when it comes to bags and I don't buy a ton of them. 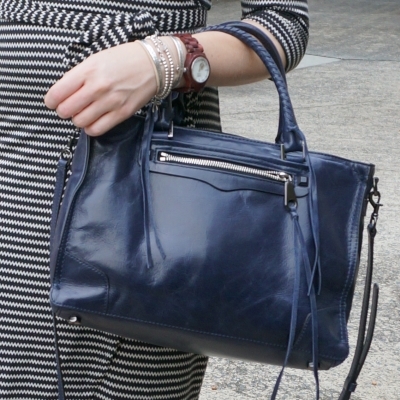 But I LOVE that navy one and it's making me think I need a navy bag in my life! Dear Mica, personally I'm a huge fan of wrapped dresses and therefore I absolutely love both of your looks! You definitely chose both times the perfect necklaces and I'm absolutely convinced I would also start a discussion when I would meet you with those mouse (or wombat) shoes :) Really wonderful looks! I love wrap dresses! And both you have featured in this post are beautiful. I hope you had a fabulous weekend! Mica, those wrap dresses look absolutely amazing on you! So beautiful. Love the prints. Love how they fit! The turquoise necklace was a beautiful touch. I loooove the color of that bag! The shape is so great too! And I love wrap dresses, I only have one though, haha. I really love the shape of these dresses! They are so flattering. Those dresses are so flattering on you! I love wrap dresses! Always such a go-to for me. These are great on you and look good with your bag. Thanks! The stripe one is frequently a favourite - it's the classic black and white I think! hehe, it's often a favourite, it's so classic! Hi Mica! I adore both beautiful dresses! Wrap dresses are so cute and chic. You accessorized beautifully as always. Have a blessed new week! I'm shaped like a box so I've never really been able to make wrap dresses work for me, but I live in hope there's one out there just waiting for me. I like the orange necklace/black and white dress combo, it's a good'un. I'm petite so often don't find ones that work, maybe you need to try a tall one? I got lucky with these, from the regular line. I just love that zig zag print dress, especially with your colorful beaded necklace! I am sure it gets you compliments all the time! I love that it is neutral enough to go with any accessories, but the wrap fit and zig zag print make it special. Hope you are having a great start to your week! it does - definitely a favourite that dress! I would have reservations about the length/tulip hem too, as a shorter gal, but you look fantastic! And golden wombat shoes! hahaha! I always find wrap dress very flattering. Go with the Golden Wombat Shoes! They're YOURS, you can call them what you want! I love both dresses - that wrap high-low hem is very flattering on. It makes you look both tall and leggy, which is pretty sweet! Lovely! hehe yes! I like the way you think :) And thank you. You look beautiful dear! And the first dress really complements your lovely eyes. I love wrap dresses too, especially with sleeves, they are comfy and can make for a polished look! Love these wrap around dresses! I'm loving these wrap dresses, lady- so cute for the office! That is such a great work bag!!! I loe how detailed you are at the outfits. I actually really love wrap dresses! They tend to cover all the problem areas. hahah! As always you look beautiful! The hand bag looks so professional and chic! I absolutely adore wrap dresses for how flattering and gorgeous they look! And just proved that so beautifully! I've never seen a tulip hem before, but I love the way it looks! The first dress really brings out your eyes. Such a lovely and sophisticated look for work. You really like that wallet ... I also have this problem, what accessories to use? Sometimes I think more is less, but I also like to see acressories complement the looks and this forces me to be more creative. These dresses are a must have of any closet. I hope you have a great week and thank you for your words on my blog. Yes it can be fun having lots of accessories to complement your outfit! I'm still on the fence whether or not I cant still rock a wrap dress or not. I had a few back after I had Penny when the office had a strict dress code. They no longer fit and the office is jeans friendly (yay) now. haha yes, no matter what they are called, they are cute! I think you can definitely still rock a wrap dress - and they are great for breastfeeding too! I like both dresses. Another plus on printed dresses is that if they get dirty, its not that noticeable ! How was it wearing the tulip cut, were you able to sit comfortably? Because the tulip hem is quite low and it's a wrap style it's so easy to wear as it doesn't 'spilt' very high. Very comfortable! I love this little take on a wrap dress. The tulip hemline is so cute. I also LOVE that striped one so much! Loving the simplicity and the chicness of these dresses dear! Really cute prints too, especially the first one. While I love both on you, I think the first printed one has the edge! It's so pretty and very flattering, as well as complementary! Wrap dresses aren't something I ever seem to wear, you've inspired me to change that! Thanks! I love the colours in the print! :) And I hope you find your perfect wrap dress! Thank you all for your lovely comments - they make me smile.